The introduction of numerous applications in the in-vitro diagnostics sector has boosted the market for microfluidics along with the pharmaceutical industry and drug delivery sector. The market is presumed to flourish in the years to come because of the new arrivals of strong companies into the market and their major contributions accounting for more profit making in future prospects. Microfluidics is basically the science of controlling and manipulating fluids, generally in the range of microliters to picoliters, with dimensions starting from tens to hundreds of micrometers in network of channels. The level of competition in the market is meant to be fierce as more and more firms are investing more finance in research and development strategies so as to provide efficient solutions to their clients as well as give tough competition to the other players. The prevailing application of microfluidics in important areas like glucometer kits and pregnancy kits along with other in vitro diagnostic techniques and point of care devices are anticipated to drive the market worldwide and show massive progress rate in future. Players are also on their way to enhance similarity in microfluidic gadgets, in terms of decreasing volume, aptitude, cost reduction, fast speculation profits, and drawing more revenues that are noteworthy for the entire market. All market players are looking for more ways and means in order to discover different other types of polymers in order to intensify the microfluidic item resemblance so that they can reduce the cost of assemblance. This in turn is prognosticated to propel the future market of Microfluidics worldwide. The global microfluidics market is anticipated to be growing at 11.4% CAGR by the end of 2025. The forecast period is set from 2016 to 2025 and the market is expected to reach a value of US$12.45 bn in 2025 from US$4.76 bn as per the 2016 records. The global microfluidics market is segmented on the basis of product, applications, material, and end users. On the basis of product, the market is classified into cartridges and reagents, chip, and instrument. The category with cartridges and reagents is seen to be holding the leading position and may continue to dominate the market segment in the near future. This is because of the noteworthy acceptance of microfluidic products in industries and laboratories that provided a wider scope of growth. Based on segmentation by applications, the global microfluidics market is categorized into drug delivery, in vitro diagnostics, pharmaceutical and biotech research, wound care management, and peripheral vascular diseases. Out of these, the in-vitro diagnostics market is seen to be drawing more revenue into the market due to its rising number of application in medical instruments and devices like pregnancy kits, and others. With respect to materials, the global microfluidics market is segmented into glass based and polymer based materials. On the basis of end users, the market is classified into home care settings, diagnostic labs, academic and research, and hospitals. From a geographical point of view, the global microfluidics market is segmented into the regional of Europe, North America, Middle East and Africa, Asia Pacific, and Latin America. Among these, North America is seen to be dominating the market for the duration of the forecast period owing to high adoption of new products. Apart from that healthcare sectors in this region is well-established which gives more growth opportunities. Asia Pacific, on the other hand is expected to show quick growth because of the rising number of geriatric population and their dependency to medical care and diagnostics for ailing various age old related health problems. Technological advancement in this region has led to better medical facilities along with proper diagnostics and care, especially in the emerging economies of China, Japan, and India. Top players in the global microfluidics market are Thermo Fisher Scientific Inc., F. Hoffmann La-Roche Ltd., Bio-Rad Laboratories, Inc, Danaher Corporation, Agilent Technologies, Inc., and PerkinElmer, Inc. This report on microfluidic market studies the current as well as future prospects of the market globally. The stakeholders of this report include companies and intermediaries engaged in the manufacture and commercialization of various microfluidics instrument and products as well as new entrants planning to enter this market. This report comprises an elaborate executive summary along with a market snapshot providing overall information of various segments and sub-segments considered within the scope of the study. 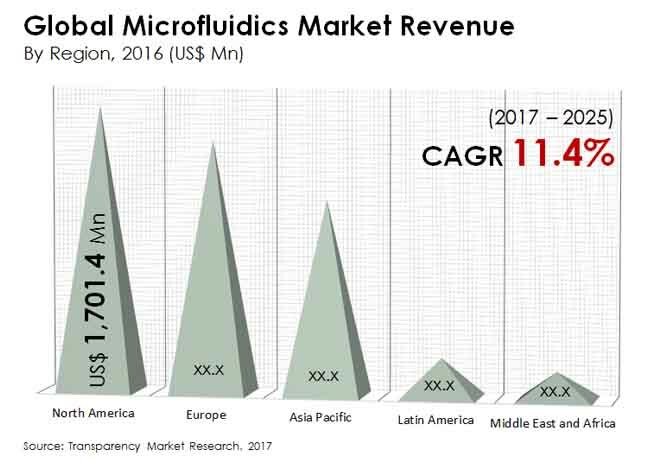 This section also provides the overall information and data analysis of the global microfluidics market with respect to the leading market segments based on major products, applications, key materials utilized, end-users, and geographies. The global microfluidics market has been studied based on major product segments, application segments, material segments, their end-users, and regional as well as national markets. Based on product type, the global market has been categorized into three major 4 segments: instruments, microfluidic chip, cartridges & reagents and others. On the basis of applications the microfluidics market is classified as peripheral vascular diseases, Wound care management, pharmaceutical & biotech Research, Invitro Diagnostics (IVD), Drug Delivery and Others. On the basis of material the segment has been classified in to Polymer based, Glass based and others. On the basis of end users the market has been classified as hospitals, diagnostic Lab, academics & research institutes, homecare settings and others. The market for these segments has been extensively analyzed based on their utility, effectiveness, sales, and geographic presence. Market revenue in terms of US$ Mn and market volume in terms of units for the period from 2016 to 2025 along with the compound annual growth rate (CAGR %) from 2016 to 2025 are provided for all segments, considering 2016 as the base year. The market overview section of the report explores the market dynamics such as drivers, restraints, and opportunities that currently have a strong impact on the global microfluidics market and could influence the market in the near future. Market attractiveness analysis has been provided in all the sections of the report in order to explain the intensity of competition in the market across different products/materials/applications/end-users/geographies. The competitive scenario among different market players is evaluated through market share analysis in the competition landscape section of the report. The section also includes completion matrix that analyzes the competition among some of the top global players operating in the market. All these factors would help market players to take strategic decisions in order to strengthen their positions and expand their shares in the global market. Geographically, the microfluidics market has been segmented into five regions: North America, Europe, Asia Pacific, Europe, Middle East & Africa (MEA), and Latin America. Each regional market for microfluidics has been further categorized into major product, applications, material, and end-user segments considered within the scope of the study. Key country (U.S., Canada, Japan, Germany, France, U.K., Australia, Canada, China, Brazil, Mexico, India, etc.) market revenues have also been provided in different regional sections within the report. Market revenue in terms of US$ Mn and volume in terms of units for the period from 2015 to 2025 along with CAGR % from 2016 to 2025 are provided for all the regions and nations considering 2016 as the base year. The report also profiles key players operating in the microfluidics market based on various attributes such as company details, SWOT analysis, strategic overview, financials, and business overview. Major players profiled in this report include Danaher Corporation, PerkinElmer, Inc., Agilent Technologies, Inc., Bio-Rad Laboratories, Inc, Thermo Fisher Scientific, Inc, RainDance Technologies, Inc., and F. Hoffmann La-Roche Ltd.